Ahar Archaeological Museum is known for its various architectural features and sculptures pieces date back to 1700 BC. A historic tenth century metal figure of Buddha is a special attraction in the museum. There are rare pieces of earthen pots which are of historical importance.Located at 3 km distance from Udaipur city, around Ahar museum there are about nineteen cenotaphs of Maharanas, where they were cremated. Among all of them cenotaph of Maharana Amar Singh, who reigned from 1597 to 1620 is more attractive. Though there are not so much to see ion the museum but the collection of the museum is very rare of which some dates back to centuries old and before that. Amongst the assortment of sculptures, a statue of Vishnu-Nag-Nathan is also worth mentioning. 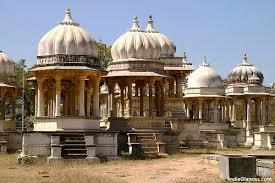 Located about 2 kms east of Udaipur is an impressive cluster of cenotaphs of the Maharanas of Mewar. There are about nineteen cenotaphs of Maharanas cremated there. The most striking cenotaph is that Maharana Amar Singh, who reigned from 1597 to 1620. Nearby is also Ahar Museum, where on display is limited but very rare earthen pottery. Some sculptures and other archaeological finds. Some pieces date back to 1700 BC and a tenth century metal figure of Buddha is a special attraction. 10:00 am to 04.30 pm, Closed on Friday and National holidays. Ahar Museum is located at a distance of 3 km from Udaipur city centre near Rana Pratap Railway station. One can easily reach here local taxi, bus or cab.